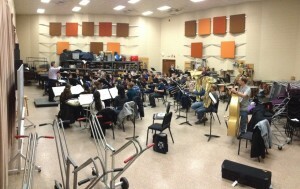 One of the best parts of being a part of the Toronto Youth Wind Orchestra is the opportunity to go on band tours. They’re the sort of experiences you remember for the rest of your life! 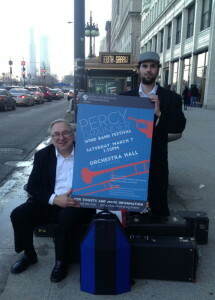 While last year’s destination (Shanghai, China) was just slightly more exotic than what we’re used to, this year the Wind Orchestra’s adventure was to the Windy city – Chicago Illinois, to perform at the 6th annual Percy Grainger Festival, being held at Symphony Center. On a bitterly cold March morning, the musicians joyfully boarded our heated bus for what would be a long journey east, filled with Tim Hortons stops and quintessential Chicago film viewing (Ferris Bueller’s Day Off, Wayne’s World etc). 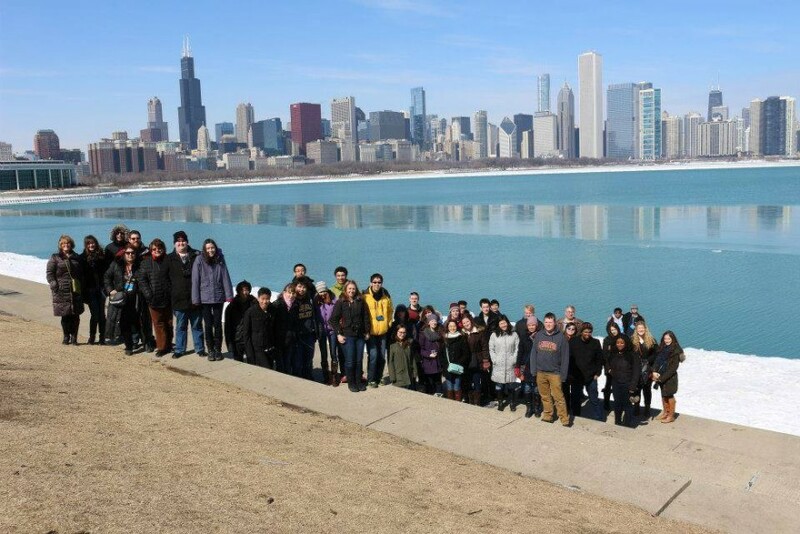 Upon arriving in Chicago, despite the promise of marginally warmer weather, we all quickly got to experience the true meaning of the Lake Effect wind! For most of the group, our first night in Chicago was spent the traditional way – Deep Dish pizza at Lou Malnati’s, and there were more than a few take-out containers brought back to the hotel afterwards. In true TYWO style, we didn’t waste any time packing in all sorts of fun workshops and activities. Our day started with a workshop led by Dr. Martin Seggelke, professor of music at Illinois State University, at the legendary Fine Arts Building (Studebaker Building) which was built in 1884. The elevator ride was certainly an experience in itself! Our workshop took place in the rehearsal space belonging to the Chicago Symphony Youth Orchestra (or CYSO), who are one of the longest running youth orchestras in the world. Dr. Seggelke’s workshop was unlike anything most of us had every experienced, and can only really be described in one word – esoteric. He also taught us the art of ‘appreciation acknowledgement’, so now it’s not uncommon for musicians to share their musical appreciation of one another – quite publicly! After a wonderful tour of the downtown area – including a photo opportunity at Cloud Gate (or the Chicago Bean as it’s more affectionately known), we were off to Northwestern University for a rehearsal, a workshop with Director of Athletic Bands, Dan Farris, and some catch up time with TYWO alumnus and Wildcat, Jeffrey Leung. One would think that two workshops in one day would be a little much, but not for TYWO. Dan’s style was completely different to that of Dr. Seggelke’s, so we all had a contrasting experience from that of our earlier workshop. It was evident that our performance was greatly impacted by the guidance from our esteemed clinicians. A visit to Chicago to play at Symphony Center wouldn’t have been complete without experiencing a performance there and that evening we did just that, being lucky enough to see Yo-Yo Ma perform with his legendary Silk Road ensemble. We strolled back to our hotel – conveniently located just a short walk from both Symphony Center and the Fine Arts building, only to return to Symphony Center less than 12 hours later – but this time it was our turn to take the stage. One of the coolest experiences of the tour had to be rehearsing the music of Percy Grainger, in the Grainger Ballroom, as part of the Grainger festival. Certainly the most grandiose warm-up room we’ve ever had the pleasure of using! Taking to the stage at Symphony Center was one of those ‘next level’ experiences. Our first release was met with widened eyes as the notes hung in the air. We knew this would be a special performance. What we didn’t realize was that we would inadvertently become a comedy act. One of our saxophonists, Marco, was having instrument trouble, so as we all warmed up and tuned on stage, he was frantically trying to fix his instrument backstage. As with any performance, once the conductor takes the stage, the orchestra stands up to acknowledge him (or her), though this stage happened to have huge doors, and as they swung open, we all jumped to our feet to welcome to the stage…. Marco! Needless to say, the auditorium filled with laughter, and Colin is never going to let us live this down. With our performance behind us, it was time to celebrate, which for us meant all-the-meat-you-could-possibly-eat at Brazzaz Brazillian Steakhouse. And with that, it was time for us to head back home. Cheers were made as we crossed the border, and as we said our goodbyes, we all knew we had experienced something truly special together. That’s the beauty of band tours – getting to know your fellow musicians, making new friends and having great experiences together!